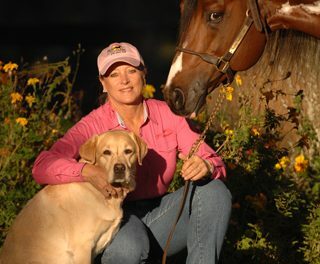 To review, we have discussed important steps to prepare for training on the trail, including reading the horse to recognize his inner energy level and working with him to release it, preparing the rider through warm up and stretching exercises, and building safety and confidence on the trail. I’ve also covered training tips for dealing with the horse who wants to always be in the lead. Let’s look at another common trail training problem: the horse who wants to run up from behind. If you are on the trail with one or more horses, your horse’s herding instinct will become evident when he cannot see the horse in front of him. This can happen when the horse in front of him turns a corner, rounds a bend, or goes down a hill. 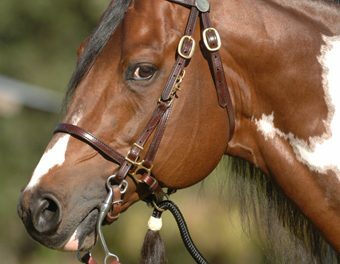 A horse may just go “nuts” when he cannot see his buddy up ahead. He may get extremely insecure as his herding instinct comes out strong. He will want to hurry and run to catch up to the other horse or horses in front. He may get extremely nervous. He may throw his head, buck or even rear in frustration if he cannot see his buddies or is held back from rejoining them. You need to realize that this situation can happen to any rider. I have experienced it myself. It is important to learn how to avoid this problem and understand what to do if it happens. Avoiding this problem depends on your level of riding and the level of your horse’s training whether outside or on the trail. When riding with others, the first step in preventing it is to discuss the importance of keeping the riding group together. Whether there is one other rider or a group of 50, everyone needs to be conscientious about not getting too far from the rider in front and behind her. Prevent problems before the group goes out by deciding on a certain word or phrase that will be used when on the trail to communicate if there is a spacing issue. If you experience this problem and it feels like your horse is getting out of control—get off him and on the ground. He will be easier to control. If the riders in front of you want to go on or are too far in front to realize there is a problem, let them keep going. Get off your horse. Give him time to chill out and stop fretting. Wait for other horses that are behind you to catch up. When they join you, your horse will have some buddies. Let him get acclimated to his new friends before continuing on the ride. If possible, your horse should have at least one buddy to accompany him on trail rides. 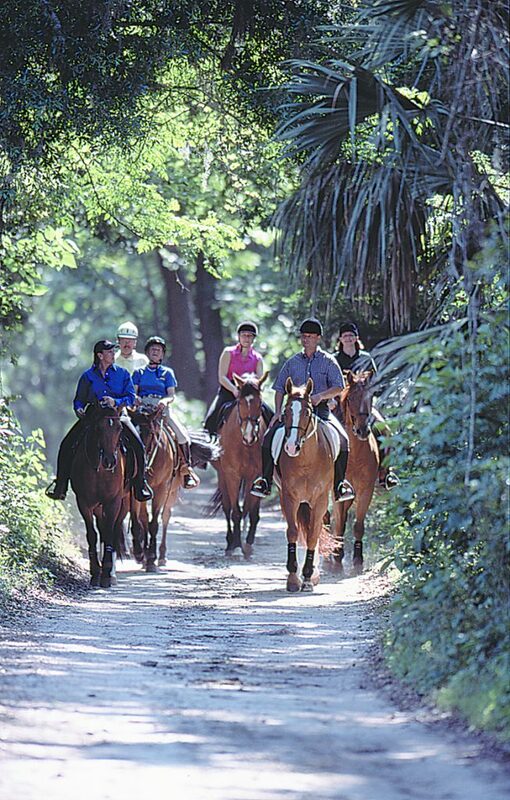 If you are riding with large group trail ride, try to have 3-4 people who will stay close to you. By doing this, you will be respecting your horse’s natural herding instincts. A horse should have at least one buddy when going out on a trail ride. The “buddy system” provides extra safety for the rider and satisfies the horse’s natural herding instinct. Here are two tips to help retrain a horse when running to catch up to the horses in front becomes a problem. #1: Practice the Single File Trail Training technique I mentioned in Palm Partnership Training™ Newsletter #94. 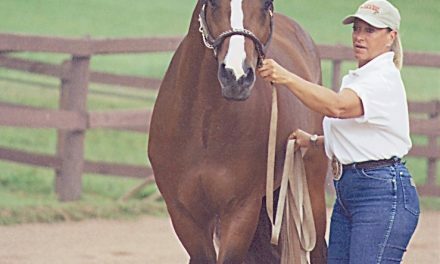 Set up a trail ride training scenario where you and your horse are among several horse/rider combinations in head-to-tail formation. Start with your horse in the lead position for a short time, about 2-3 minutes. Then shift positions in the line-up so he is the second horse. Stay in this position for a short time, then move him back to the lead. Continue leading for another short interval, then shift to be the third in line. Hold here for a while, then take him back up to the second position. From second position, rotate into fourth position for another short segment, then back to third, and so on. Keep switching places so the horse learns to concentrate on his rider and the environment, rather than other horses. #2: In a big field, practice doing large figures with a group. Start with one other rider, then add two, three, and four more riders. Ride figures in groups of 2, 3, and 4 riders, then separately. Mix up the combination of riders, then go back to working alone. As long as the horse has a vision of the other horses, he will not experience the trauma of being separated. The more you work him with a group, then away from them while still within sight of his buddies, the more he will develop his own individuality and a stronger independency.